In Defense Of HammerSchmidt - Dec. 5, 2018, 10:18 p.m. I for one still love my Hammershizzle. Looking forward to a little snowfall to use the semi-fat Six-Pack to its full entertainment potential. This bike was my primary for 5 years or so and I disassembled and re-greased the Hammer after around 3 years of all-season use. Innards/grease still looked pristine. Oh, and I probably shouldn't jinx myself, but I'm on my original BB. With the combination of the HS up front and 6 cogs on a single speed hub in the rear my driveline lifespan is at least triple what I get out of XTR 1x11 with its cross-chaining BS* on another bike. ...and the XTR has never seen conditions as nasty as what the Hammer routinely saw. 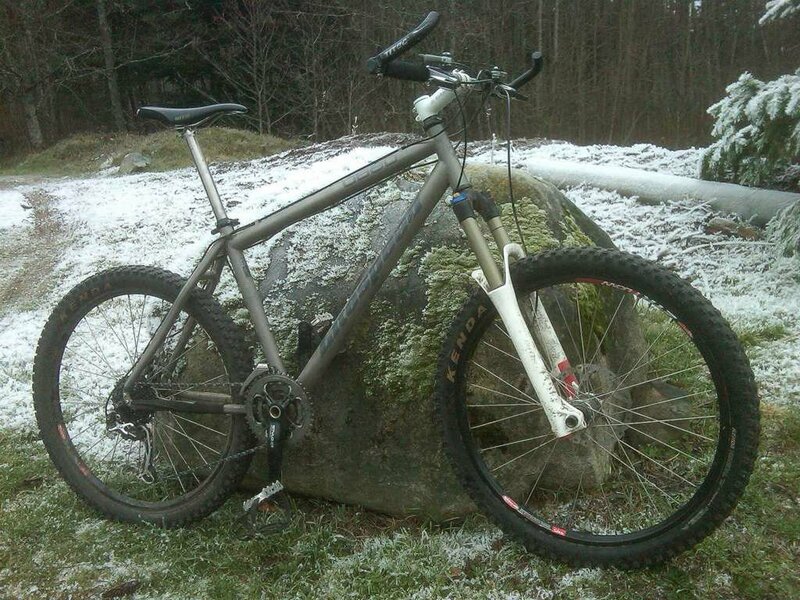 Re: NSMB - 2019 - Hardtail Thread - Jan. 18, 2019, 8:26 p.m.
How's this for combining 10 year challenge with the discussions of titanium! 2007 Litespeed Obed. 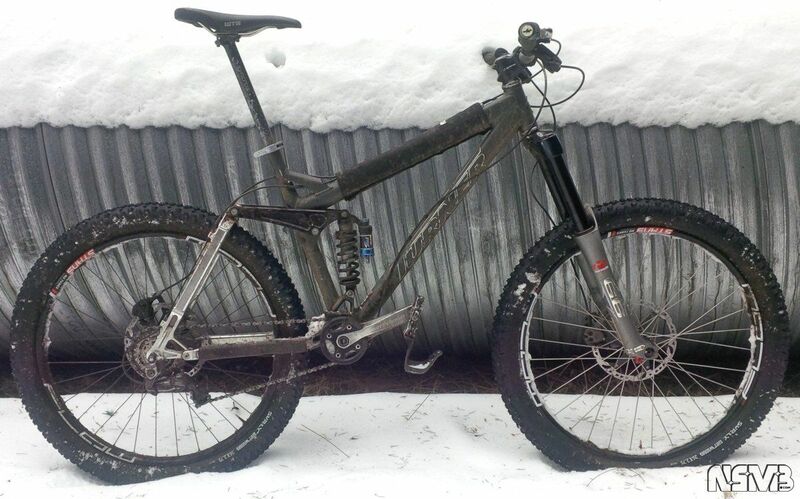 Basically what Litespeed built for Cove's Hummer, except mine is a freak with no head-tube gussets. Most recently ridden on New Year's Day 2019. It's actually a pretty stiff for a Ti bike. I feel like my steel Blizzard LT actually might have a little more spring to the rear triangle, but some of that sensation may be because of the plusher Ti-coil Marz 44 on the Bliz vs. the "sporty" Magura Thor air on the Obed. Re: Magura MT5/Trail/MT7 questions - Nov. 16, 2018, 6:19 p.m. I saw people querying the thickness of the Magura rotors (2mm) compared with the shimano/SRAM offerings? Any problems with using the non-spec Storm rotors? I run MT7s (and Martas and Louises) on centerlock XT and XTR rotors and I've found that if you run the pads down really low, the levers will start to get spongy. Gently pushing the pistons back in to install thicker pads usually purges the air back into the reservoir and restores proper firmness. I did recently squeak one last ride in on a set of excessively worn rear pads which resulted in the lever going to the bars and allowed enough air into the line that I had to do a bleed despite putting in new pads. I think the MT7s have less excess fluid in the reservoir (relative to the piston area) because a number of years ago, I ran some Louise pads down until packing plate hit rotor and still didn't get too much air in the lines. Re: long travel wagon wheelers - July 21, 2018, 8:34 a.m. So the biggest bike on the shore is officially here. Re: Seattle area. - June 13, 2018, 5:53 p.m.
Re: Picking up heavy things - Feb. 12, 2018, 7:07 p.m.
Re: If you aren't riding a bike professionally - Feb. 9, 2018, 10:18 p.m.
Re: Galbraith - Feb. 9, 2018, 10:04 p.m.
Re: If you aren't riding a bike professionally - Feb. 1, 2018, 9:42 p.m.
Re: Transition bike demo in Bellingham - which trails to ride? - Jan. 26, 2018, 8:49 p.m.
where do the Transition guys really push their Patrol's and Sentinel's? sounds like the local riding to their HQ (while very very good) is not the ideal terrain for these 2 bikes. further afield in Washington? i'm woefully ignorant of greater Washington riding areas outside of Bham. The unpublished/published trail ratio around Bellingham is at least the same as, if not higher than N/W Van. Re: Transition bike demo in Bellingham - which trails to ride? - Jan. 26, 2018, 6:24 p.m.
Have you ridden Hush Hush on northern Chuckanut? It's probably the most Shore-like tech for a "public" trail in Bellingham. Sort of between 7th and Leppard maybe? It'll be a snotty angry rooty challenge right now. I'd park at Arroya Park/North Chuckanut, go up to Interurban, along to Lost Lake North, grind up to Hemlock, then Hemlock to Raptor Ridge connector, left on Raptor to the lookout, then back down Raptor to Lost Lake, then along Madrone Crest to Hush Hush and back down. I haven't ridden Galbraith since before Christmas, so I haven't seen the results of the recent logging of the north end first hand. From what I've heard, I'm not in a hurry to go check it out.